Words to inspire compassion, honesty, and the honoring of our authentic selves- who we came here to be. Words that describe one way of experiencing the world in the hope that it will inspire the sharing and honoring of many other ways. Our differences make us stronger, our similarities bring us together, and our love connects us all into one big messy, complicated, and amazing family. 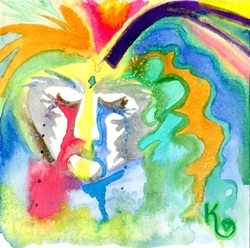 Art to support and remind us of our authentic selves so we can more easily move through this world and give our gifts. Tools to help us loosen the labels and boxes we have taken on or been shoved into so we can find the beauty that is shining beneath them- the beauty of our true selves! Let's imagine for a second that we're sitting on a comfy couch together, or next to each other at a quiet cafe, or taking a walk through the woods together. That's how I want you to feel when you're here- like we're hanging out, open and trusting, able to look each other in the eye and know that no matter what we say, we are loved and valued and amazing. We are both experts on our own experiences and feelings and thoughts- and that is immeasurably important! I want us to feel that we're taking a journey together as equals- there are things I experience that you don't, and things you experience that I don't. It's easy to slip into the guru role when writing a blog, but I want you to know that your comments and presence here can inspire and direct me just as much as my words or art may inspire or direct you. 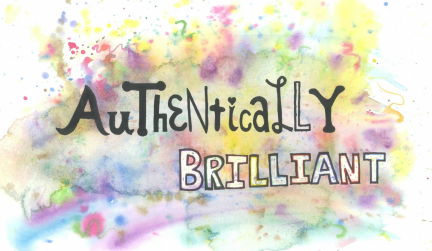 Authentically Brilliant is the couch or the cafe or the woods- the place we can connect, support, encourage, and validate each other. It is a calm and refreshing and honest and comfortable environment to discover our authentic selves, to learn to value that self, and yes, just maybe even learn to love it. It is a place where we can learn to allow that authentic self to shine brilliantly and eventually, to allow that authentic self to bless the world with the gifts only it can give. . . and there ARE gifts; I promise you. Your authentic self is still there, no matter how deeply you have buried it, or tried to cast it off or cut it out. It's waiting patiently (or maybe with some urgency), glowing with unconditional love for you, and we are here to learn to connect with it, discover how it best expresses itself, and learn to love it back. On this site you will find much honesty. I'll probably talk about some things I've felt or thought that may rate pretty high on the crazy meter. When I finally saw and heard them I probably felt the same! That's okay, because my goal isn't to convince you that my feelings and thoughts are right. You don't have to agree with my take on things at all, even if you feel drawn to this site and know it's a place you need to be. My goal is to help you find compassion for your own crazy feelings and thoughts because we ALL have them. And they are all okay. Truly. It may be important that we never act on them, but their existence doesn't make us bad or beyond hope or evil or even crazy. Maybe you have tried running from them, or burying them, or hating them. Maybe that hasn't worked very well and they're still there, right by your side. Here we can try another way, safe in this space.